Brown. Who'd be a politician? As often as I watch it, I freely admit I’m not a fan of Sky News. Their insistence on making mountains out of molehills is teeth grindingly irritating and, quite often, toe curlingly embarrassing; particularly when they partake in the grilling of news subjects who have clearly said all they need to say. Just shut up, Kay Burley. Move on. Maybe that makes me two faced. 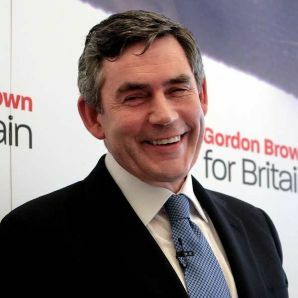 If it does, I’m with you, Gordon Brown. Today, he called a 66-year-old woman from Rochdale a bigot having just engaged in what looked like a somewhat frustrating conversation with her. Mrs Duffy (how often will we hear that name over the next few months/years?) was a straight-talking, honest woman with very clear views, and there’s nothing wrong with that. She was a handful and the conversation she struck up with the PM ended up being a very one-sided affair. The resulting ‘insult’ was uttered off-the-cuff, in the back of the PM’s car as he departed the housing estate. It was mildly amusing, but certainly nothing to lose sleep over. It won’t sway my vote either way. But, of course, no one’s interested in analyzing her comments. Everyone is now interested in one word – ‘bigot’. It’s not Brown’s fault, I’m afraid. In my opinion, the reason for the endless, tedious replays of the incident in question lies squarely at the feet of the media. They will run this story into the ground, drag in every no-mark ‘expert’ or columnist to provide their take on it. They’ll constantly say ‘we’ve received lots of Tweets and emails about this’ before reading out the most damning. And they will do this for the rest of the week, regardless of what else happens in the world. There is more of a hint of bias about Sky News’ coverage in particular, with every sentence uttered by their reporters seemingly intent on painting the PM as a nasty bit of work. I don’t think he is. Throughout this election campaign, I’ve warmed to him (and this comes from someone who has written some pretty disparaging thing about him on this very website). I like the fact he freely admits he isn’t comfortable in certain situations and I actually like the way he deals with the regular gaffes he makes. The footage of his apology on Radio 2 showed a man completely and utterly knackered and fed up with it all. He’s quintessentially British and part of me admires that. Yes, he’s made a mess of things, but who would want his job? In any position of power or management, you have to make decisions and say things that aren’t popular with everyone. Whoever ends up as our new PM next week will have the exact same problem and I refuse to believe that we won’t be talking about them with the same disregard six months down the line. By far the most insulting thing I’ve heard today is Adam Boulton’s surmise of the woman at the centre of this controversy; ‘Mrs Duffy, while clearly not the most literate of people…’ If ever there was a more insulting, sweeping generalisation of the very people who help pay Boulton’s wages – the people of this great nation – that’s it and it was far, far worse than Brown’s comments today.